Me and my boyfriend made a ‘pact’ that we will not celebrate monthsaries. Instead, we will save money to celebrate memorably our anniversary. How? Travel! 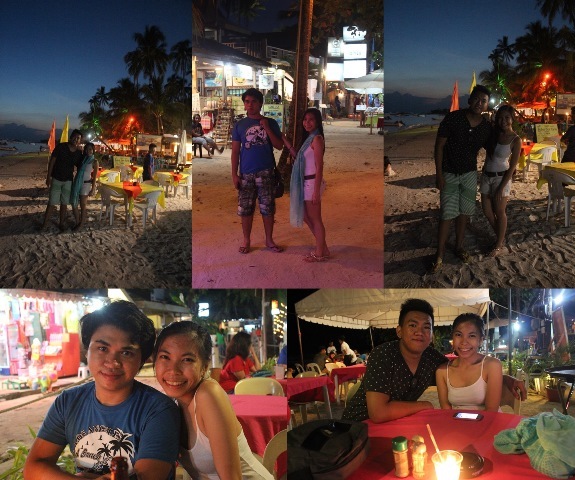 Our first anniversary celebration was supposedly in Boracay, but due to insufficient funds, we decided to celebrate it in our favorite city – DAVAO. And also, our anniversary is also my birthday. 🙂 Check my blog post about our Mountain to Shore Adventure in Davao (Part 1) here (Part 2). 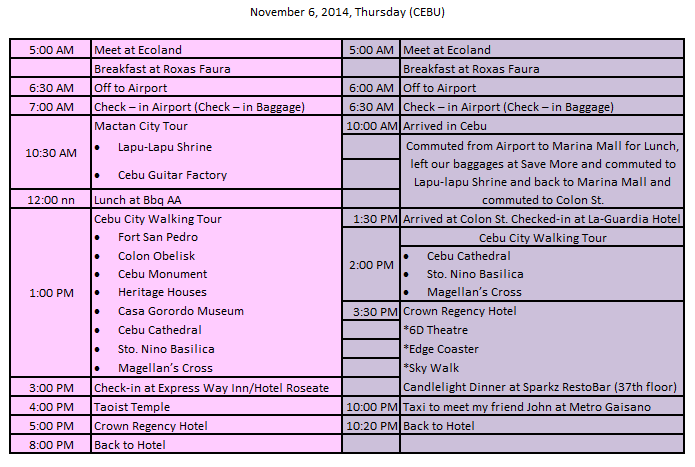 This is my very first time to create a DIY Itinerary without any initial idea about the place. I have never been to Cebu for a local tour, only for connecting flights and ferry stop-overs. So, I did rigid research how to go and where to go. Since I was still that time in CDO, I need to travel from CDO to Davao for 9 hours at night. (I have computed the expenses and considering the time if I fly from CDO to Cebu, so I opted to take the flight from Davao. And considering that it will be our first flight together. We arrived in Cebu at 10:00 am. We commuted to Marina Mall in Mactan. There are jeepneys in the airport. You can also ride taxis but definitely, they cost more. We left our baggage in Save More (but they told us it is not allowed. Use your tactics.) We had a budget lunch trying the ‘ngohiong’. After a quick lunch, we commuted and rode a jeepney to Mactan Shrine. Just ask any security guard in the Marina Mall. They will tell you what jeepney to hop on. We traveled back to Marina Mall to get our baggage. We crossed the road from and took a jeepney to Pavillion Mall. From Pavillion Mall, we rode another jeepney to Colon St. And we finally checked-in at La Guardia Hotel for only P500 per night. We rested for a while and we are ready to take the City Walking Tour. From our hotel, we walked along Colon Street until we reached the Basilica. 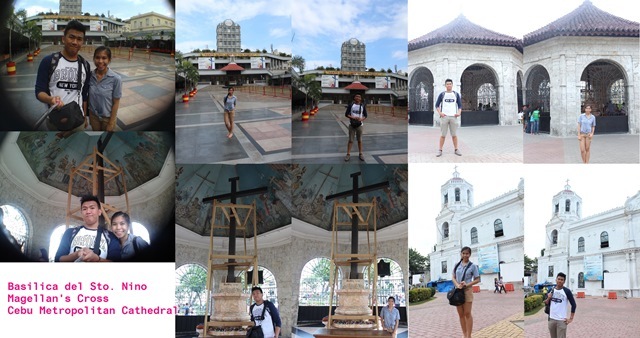 From there, you can also visit at Magellan’s Cross and Cebu Metropolitan Cathedral which are very near at the Basilica. In the middle of the tour, we had a quick snacks at McDonalds fronting Magellan’s Cross. From Colon St, my travel guide said that Crown Regency is just walking distance. So, we walked. I didn’t expect that the distance isn’t really walking at all, or maybe I was just too tired that time. But nevertheless, we enjoyed walking along the busy street of Cebu. We have availed the promo of Crown Regency P900.00/head for the 3 activities: 6D Theater, Skywalk, Edge Coaster and a buffet dinner at Sparks Restobar. Truly, worth it! Around 10pm, we went to Metro Gaisano which is very near to our hotel to meet my best friend John. And I invited him to join in our Bohol the next day. We rested around 11pm. 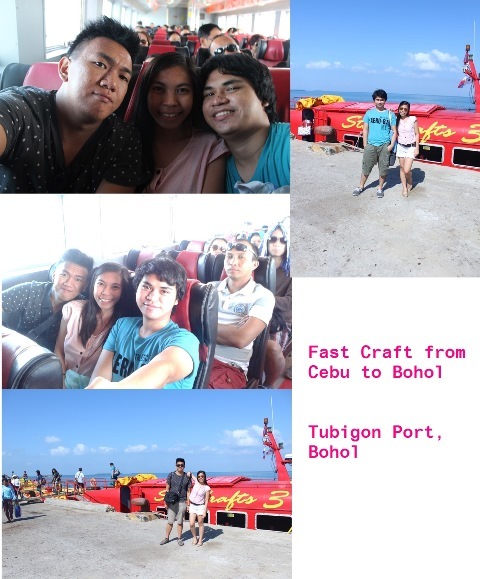 We woke up early to catch-up an early trip to Bohol via Tubigon Port. The ticket costs P175 per person. It was an amazing race for us because we arrived exactly when the bus bound to the ferry to take us to Bohol is about to leave. We are the last person to buy the tickets and hurriedly ran to the boarding area and yes, we are on! Very thrilling indeed! While on the ferry, we hurriedly contact someone who could accommodate us for a countryside tour. And good thing, there’s someone who answered our call and message and agreed to fetch us from Tubigon (so he need to travel from Tagbiliran to Tubigon, that is an hour.) The person asked us if we can wait for an hour since we will arrived around 9am because he needs to travel from Tagbilaran. And we agreed. That is P2000 whole day exclusive tour for the three of us inclusive of fetch from port to Panglao Island. While waiting for our hired driver, we had our breakfast at Tubigon Market. And finally, we met Kuya Roni. Kuya Roni is our driver/tourist guide. 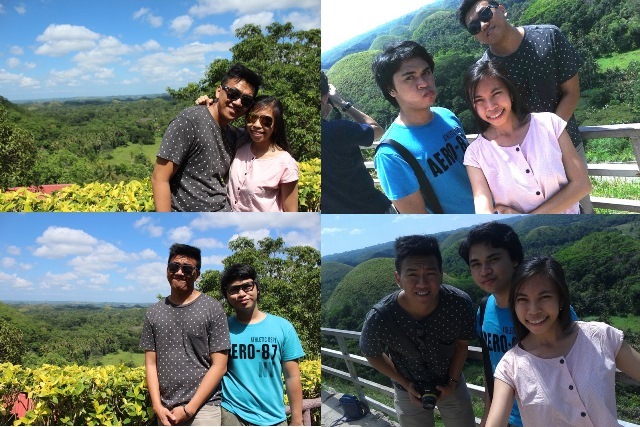 So from Tubigon, our itinerary was Chocolate Hills, Butterfly Sanctuary, Man-made Forest, Tarsier Sanctuary, Hanging Bridge, Lunch at Loboc River Cruise, Baclayon Church and Blood Compact Site. Entrance for Chocolate Hills is P50.00 per person. Entrance for the Butterfly Sanctuary is P35.00 with tourist guide. We enjoyed the very delicious Ice cream sold at their souvenir shop. Worth a try! No entrance fee because this is just along the road. Be sure to be cautious of the passing fast vehicles that you cannot see from a far because of the blind curves. 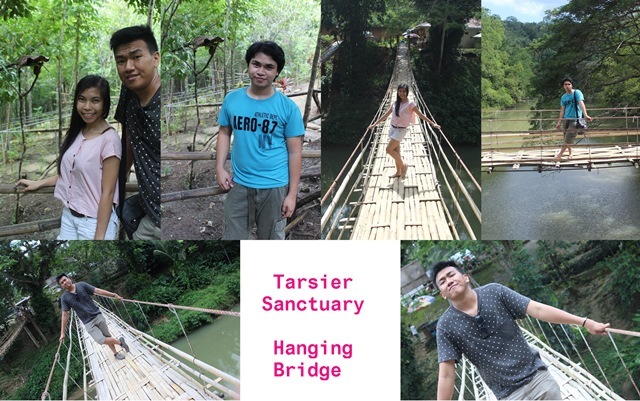 Tarsier Sanctuary entrance is P60.00. Hanging Bridge is P20.00. 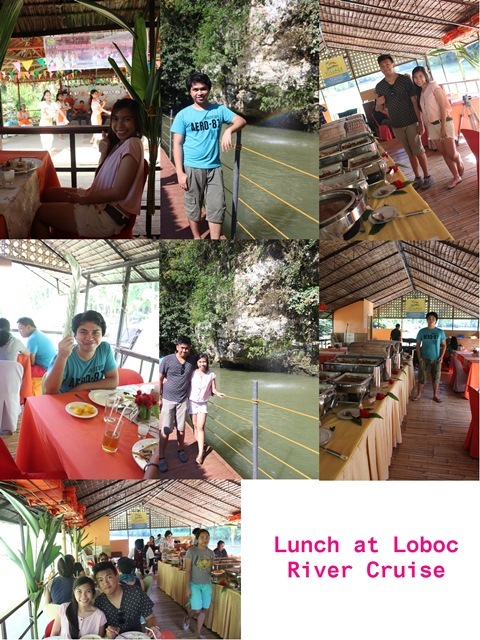 Lunch per head at Loboc River Cruise is P400.00 per head. 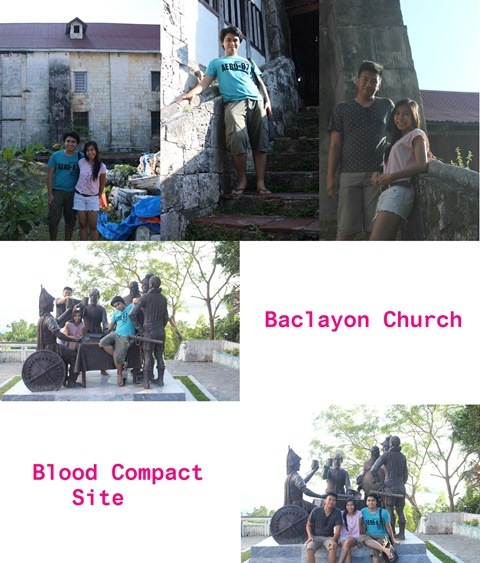 No entrance fees at Baclayon Church and Blood Compact Site. Around 4pm, Kuya Roni took us to Panglao Island and helped us look for a cheap place to stay. 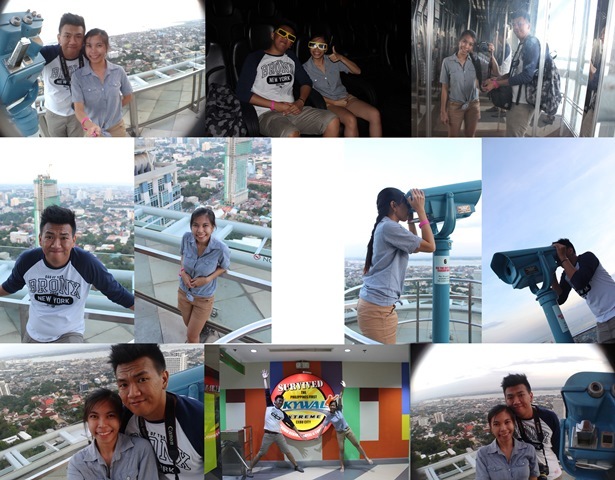 We finally saw Bohol Sea Breeze after 4 tries. 🙂 P900 for a night good for 3. It is not along the beach side but it is just okay because beachfront hotels and inns are quite expensive. We rested for a while and when the sun already set down. We went out to check the famous Panglao Beach. My most favorite activity is walking at the shore at night. We had a barbeque dinner and a bit of chilling out with some beer and a reggae mix by a local band. Perfect combination of sea, sand, lights, music and persons you love. We woke up early and excited to soak at Panglao pristine white beach. We just left our things at the shore and enjoyed the beach. Too bad that according to the boatman, we should be careful because of the jellyfish around. Around 9:30 am because the sun is already up. We went back to the inn and have our breakfast P180 or the 3 of us. We packed up and went back to the beach to take pictures. We asked the owner of the inn how can we travel back to the port and he said that we need to take a bus at Tagbiliran Terminal to Tubigon. We hired his tricycle for P200 for the 3 of us to take us to the terminal. The bus is at P75 per head to Tubigon and we had a promo fare of P150 ferry boat to Cebu. We had our late lunch at Tubigon Market. We left Bohol around 3pm and arrived around 5pm. We went to La Guardia Hotel but unfortunately there are no vacant rooms for us. Actually, this was the most stressful part of the trip because we spent time and money looking for hotel. Until we reach Gran Prix Hotel, fronting Sampaguita Suites neat Summit Circle, for P1000 a night. Anyhow, the tiredness was disregarded because their service is good with welcome drinks and accommodating staff. We are then excited to our most favorite thing to do – food tripping. I have research good places where to eat in Cebu. So, we just asked the hotel staff how to go to Lahug. Good thing, we will just ride a jeepney right in front of our hotel. We went to IT Park. We walked around and found a mini-BGC. We went also to the famous La Vie Parissiene and met some of our fellow Midsayapenos who were working their. We had some champagne and french pastries. We were full yet we don’t have any plans to stop the food trip. We went to Pizza Republic and enjoyed the DIY Pizza. Around 11pm, we went back to the hotel because I am already too tired. We woke up around 7:00 am and ready for a tour at Taoist Temple. 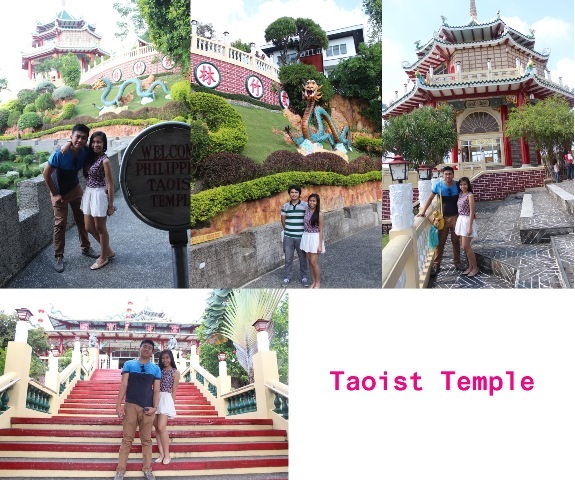 When you go to Cebu, you should not forget going to the famous post-card picture, Taoist Temple. John offered us a tour there. We rode a jeepney just in front of our hotel. You can signage of Taoist Temple along Lahug road. We stopped in the signage and crossed the road. We hired a motorcycle to take us up to the Temple. P20 per head. It was a long-walk from the unloading area of motorcycle but differently worth it as you can also see the overlooking Cebu City. 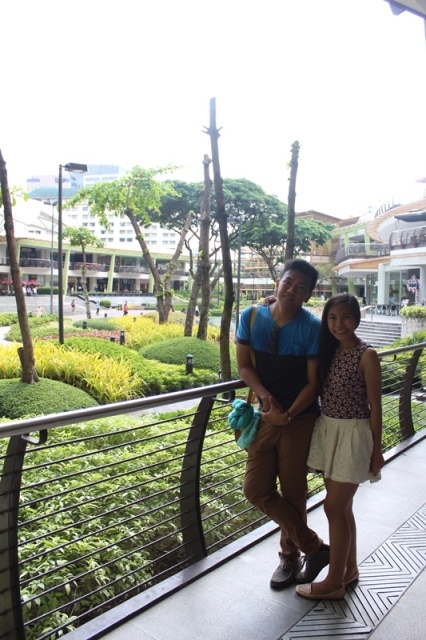 After Taoist Temple, we went to Ayala Mall for sightseeing and went to Larsian for late brunch. We went to Shamrock store at the Summit Circle to buy pasalubong and finally, back to the hotel to check-out. Around 11:30 am, we rode a taxi (John paid for us) and went to SM City to spend the remaining hours before our flight. We left our baggage at the passengers’ lounge. We roamed around have some chill time at Cobo Milk Tea Shop. Around 2:30pm, we rode a taxi bound to Mactan Airport for only P90. 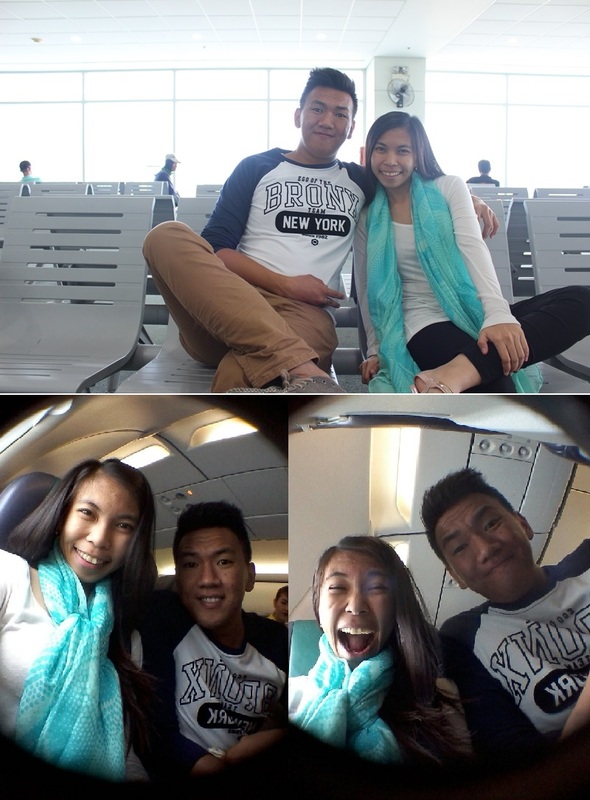 And finally, we say thank you to Cebu and Bohol for an awesome and memorable experience. We will for sure come back! Our total expenses per head is P4500 inclusive of all the hotel accommodation, food, tours, sky experience at Crown Regency, jeepney and taxi fare. Exclusive of airfare. you can minimize this with your hotel accommodation, since I told you earlier that we had a hard time looking for hotel in Panglao and Cebu on our Day 2 and also with the taxi fares. And we had a lot of food trip and we allowed ourselves to splurge on food and pasalubong. Inclusive of our ticket P6250/head for 4 days and 3 nights all in for Cebu and Bohol. In case you have questions, please do not hesitate to comment in this post. And please also like my facebook page to view our photos in Cebu and Bohol adventure. Thank you for reading! Upcoming post for my Oslob Adventure with my friends. Nice joba… very informative blog. I like the idea of walking from basilica to fuente (lol) maybe when the sun is hiding from the clouds. Hahaha. Keep it up! Hi , i would like to ask if you have a contact number of your driver (Kuya Roni) cause we also like to ask him if he could do a tour for us in bohol. I sent you an email. 🙂 Thank you Joberlyn! Hi John! Did you receive my reply? Hi do you still have the no. Of kuya roni?para siya nalang rin contacn namin once go to bohol. Nice joba. Very informative blog. I like the idea of walking from basilica to crown regency (lol) maybe when the sun is hiding from the clouds. Hehehe. Keep it up! Hi I would like to know sino yun contact nyo nung nag countryside tour kayo sa bohol? kindly email me the info please, I would like to message you sana in fb but it will go to your “Other” folder kaya I wrote here instead. Thanks. Hello! May I just ask your contact on your Bohol tour? Hehe. Can you please email the details? Please 🙂 I’ve read your blog and thanks, so informative. Me and my friends are planning to borrow your DIY itinerary sana hihi thank you! Hi! Your blog was really helpful. I would like to use it as reference for our upcoming Cebu-Bohol trip. May I also ask the contact details of your tour guide? Thanks! Hi! Did you buy your Stracraft tickets bound to Bohol ahead of time or just went straight to the port and buy the tickets on the day itself? When you were in Bohol, was the Php 2000 inclusive of the entrance fees or was it just the payment for the tour guide & van rental? does that include the van rental? Sa la guardia hotel din ba kayo nagstay? Ppunta kasi kami ng cebu this friday, and 1st day itinerary namin is City Tours then in the evening sky adventure okay naman siguro yun noh? Ginagaya ko kasi yung itinerary mo for cebu 🙂 thanks! Hi, is it okay if i will take Bohol return flight to Manila instead of returning to Cebu from Bohol? I really find this post very informative. I just booked a flight to cebu for two for 4d3n. We have to do our tours DIY since it would cost the two of us a lot if we will contact a travel agency. Hi can we have your contact for the bohol tour? Were planning a trip next year. Tnx in advance. thank you very much for sharing your experiences in cebu and bohol. my friend and i are planning to go to these places in january (next year), and though it’s quite early, we have already booked our ticket. can you kindly give us the contact number(s) of your tour guide(s)? It was nice reading your blog. Very interesting! 🙂 I would like to us sana if magkano ung estimated overall budget for 4d3n in cebu katulad po sa inyo since first time po namin magttravel ng medyo malayo ng partner ko. Hihi. We’re from Cavite po. Thanks po sa response in advance. God bless! This is so nice! I Just booked a flight to cebu just this moment and will follow your itinerary. Could you give me the number of the person who assisted you on your tour on bohol? Thanks! thanks for this blog. pwede ko din ba mahingi yung contact mo sa bohol? :)) amaraming salamat. Can i also get your contact for Bohol Tour? Hi Joberlyn, 🙂 Good morning. 🙂 i cant sleep while reading your blog. It help us a lot. 🙂 May I ask the contact in Bohol? How much did you spent in Panglao? 🙂 Thanks. Balak namin na 1day lang sa Bohol pati na sa Panglao. Hehe any advise? 😉 Thanks a lot. GOD BLESS😉 . Hi! Thanks for the info. Impressive! Mau i know if you still have kuya Ronis # in bohol. I would love to hire himon our tour on jan.
Good afternoon. Thanks for your blog it’s so informative. Anyways, my family and I are visiting Cebu and Bohol this December. We highly need a van rental for Bohol tour because of the kids. Can I have the contact details of your tour guide in Bohol plus van rental? It would be a big help. Thanks and more power! 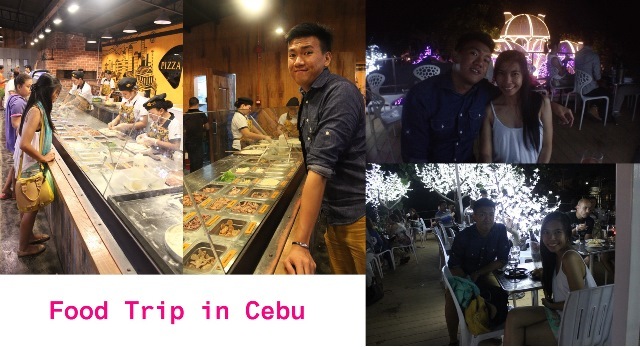 Nice blog, so helpful for people who want a DIY vacation tour in Cebu. Can you share to me your contact in bohol, we will be there on sat. Thanks! Hi! We are planning a trip to cebu on December. I was wondering if we could include Bohol. How long is the trip to Bohol from Cebu? and is it advisable for us to do a diy itinerary, the cheapest tours and accommodation i could find is at 5k coz we already have our promo fare to Cebu. Would you give us your contact person & his number for bohol tours or cebu tours so i’d know what to do. I was assigned to plan on this trip. Thanks for your help. Hi Vivian! The trip is approximately 2 hours. Yes. We did the tour on our own in Cebu but in Bohol, we hired a van because commuting in Bohol is quiet hard. Please send me an email so I can give you their the number. 🙂 Thank you Vivian! Thank you for sharing your itinerary! I’ve been trying to do a DIY countryside trip too, but I’m having difficulty determining the mode of transpo from one spot to the other. Haha! Nag enjoy akong magbasa. Since first timer lang din namin na pupunta from manila to cebu to tagbilaran to manila on July 9, 2016 o July 12, 2016. Salamat talaga sa mga informations. Ano rin po contact details ni Ronnie? Ask ko rin po sana contact details ni Mang Roni. Nag message din po ako sa FB account nyo. Do you still have contact with kuya roni (your driver from tagbilaran who travelled to tubigon port)? Thank you! Hi Miss Joberlyn, Thank you for sharing your travel. Will you please send me your contact in Bohol and the place where you stayed? Thank you! Wow! I really enjoyed reading your blog. Cebu and Bohol are two of the must-visit places in the Philippines. Aside from stunning natural attractions, you will be pleased by how they accommodate tourists. Thank you for sharing your 4-day tour itineraries. This was so informative. 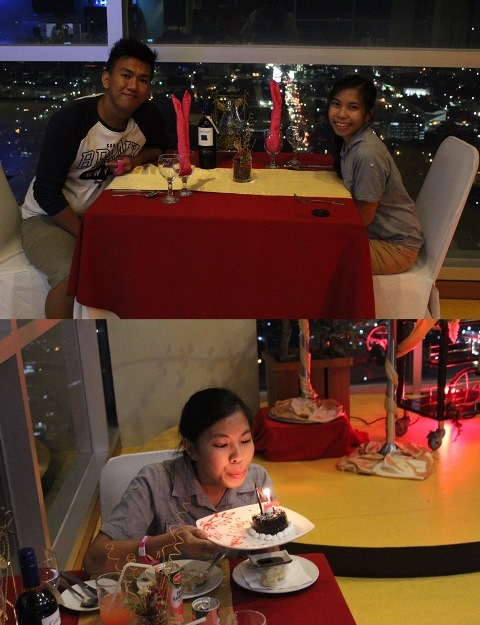 Hoping you both have more anniversaries and more adventures. I also sent you an email asking contact details of Kuya Roni. Hello, Joberlyn! I also sent you an email to ask for the contact details of Kuya ronnie kung okay lang po? Thanks in advance. 🙂 This is a very helpful blog by the way. Hi Ms. Joberlyn! I enjoyed reading your very informative blog! My whole family of six (6) are going to Cebu this June 2-7 2016 and your blog really helped me a lot! 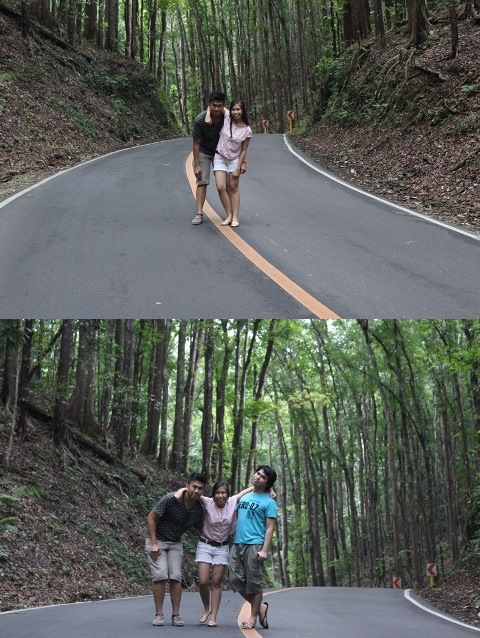 Since madami kami I really have to budget the vacation, We plan to visit Bohol w/in those days and copy your DIY trip! can you please send me contact details of kuya Roni the driver and the hotel that you’ve stayed in near Panglao beach? 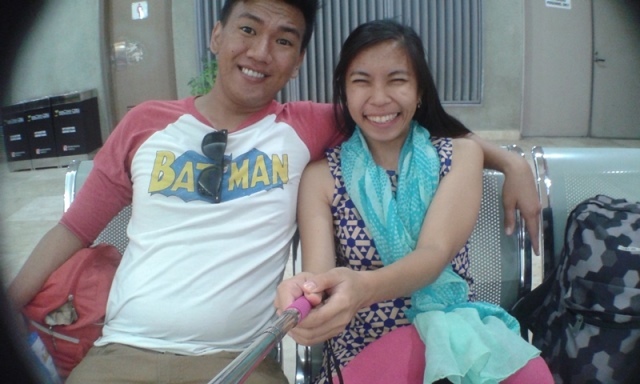 thanx so much po…..
Hi Joberlyn! I like your blog.. I’m planning to have side trip in Bohol too when I come back to Cebu.. Where did you ride ferry going to Bohol? Do I need to go to North bus terminal to check the schedule of trip? Or direct to Port of Cebu? I don’t know where to go.. May I know who’s your contact in Bohol? Thank you! Can you send me email cause I cannot attached the contact number here? joberlynmanaois@gmail.com 🙂 Thank you Bianca. Hi Joberlyn! I like your blog. Its very informative.. I need to type again to publish my comment.. By the way I’ll be back to Cebu and planning to have side trip in Bohol. 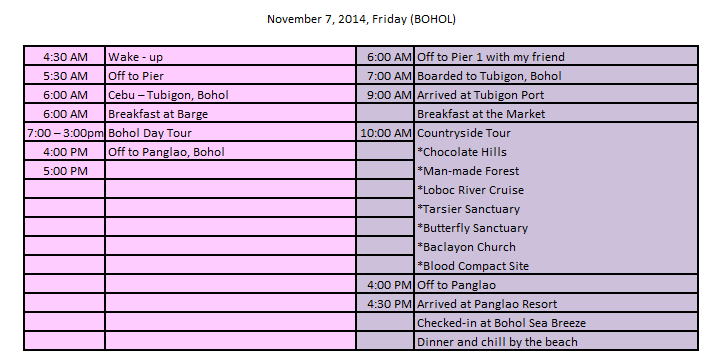 Where will I go to check the schedule of trip to Bohol (vice versa)? Do I need to go to North bus terminal? Or to Cebu Port? I don’t where to go. Please kindly share the contact details of the driver. Thanks! Hi Joberlyn! This is my third attempt to write on your wall since the internet is to slow. I can’t post it. I like your blog, it’s very informative.. I’ll be back in Cebu and planning a side trip in Bohol. Can you please share the contact details of the driver? May I know also where to ride ferries, I need to check the schedule of trip to Bohol (vice versa). I only have limited time to explore Bohol. Thank you! Hi! I would appreciate if youcan send me email at joberlynmanaois@gmail.com so I can share to you my contact. 🙂 Because I cannot attach it here. 🙂 Thank you!! Hi!very nice travel blog and a very good travel guide as well.. im planning on going to bohol this saturday.. can u please send me the number of your hired van.. jericobasan@gmail.com.. thank u in advance..
hello..puede po pahingi ng contact number ng tour guide nyo sa Bohol. Hello there! Would like to ask you to send me email through joberlynmanaois@gmail.com so I can send you the details. Can’t attach the file here in the comment section. Thank you! hi! this was really an informative blog. would be grateful if you can share the contact number of kuya Ronnie for Bohol trip. I already sent you an email. thanks heaps! Hi Mona! Did you receive my reply? Thanks in advance! Hope to hear from you very soon! Hi Claudine! Did you receive my reply? Hello. Do u happen to have contact number of kuya roni. Tour guide from bohol? Hi Joberlyn! We’ve sent an email to joberlynmanaois@gmail.com and havent received any replies yet. I asked about the driver you hired in Bohol. 😊 Please reply. Thank you! hi can i have the number po ni kuya roni? may plan po kasi kami ni bf mag cebu-bohol tour this coming november..thank you!